An intricate novel that surely draws together three disparate societies and their interlocking characters. It is thoughtful, provocative and playful as it artfully blends science fiction, fantasy and suspense to create a story that is grand entertainment. In Cold War England, Professor Henry Lytten, having renounced a career in espionage, is writing a fantasy novel that dares to imagine a world less fraught than his own. He finds an unlikely confidante in Rosie, an inquisitive young neighbor who, while chasing after Lytten's cat one day, stumbles through a doorway in his cellar and into a stunning and unfamiliar bucolic landscape—remarkably like the fantasy world Lytten is writing about. There she meets a young boy named Jay who is about to embark on a journey that will change both their lives. Elsewhere, in a distopian society where progress is controlled by a corrupt ruling elite, the brilliant scientist Angela Meerson has discovered the potential of a powerful new machine. When the authorities come knocking, she will make an important decision—one that will reverberate through all these different lives and worlds. 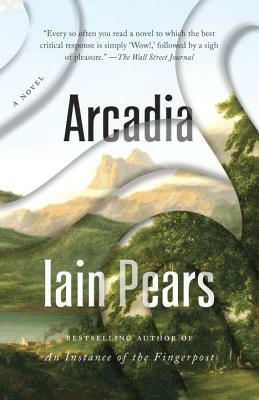 IAIN PEARS is the author of the best sellers An Instance of the Fingerpost, The Dream of Scipio and Stone’s Fall, and a novella, The Portrait, as well as a series of acclaimed detective novels, a book of art history, and countless articles on artistic, financial and historical subjects. He lives in Oxford, England.